There are many ways to determine the value of a domain name, but one of the lesser known and often overlooked factors is understanding where your traffic is coming from. 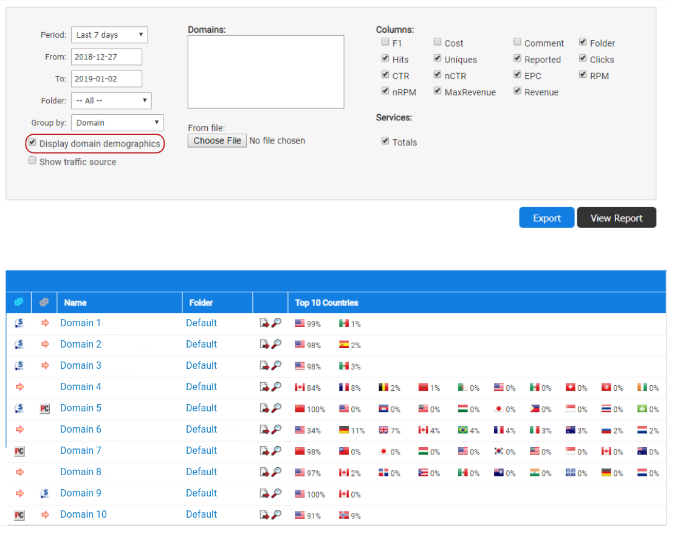 The AutoPilot Demographics Report provides a free and fully transparent snapshot of which country your traffic is originating from for each domain in your portfolio or your entire portfolio as a whole. We use this information to help target demand for your traffic. For example, if your domain visits are mostly from the UK, we know where to sell your traffic using Maximizer Advertising Channel. Premium advertisers will then pay more for that traffic because they know it is coming from their target market, which ultimately increases the value of your domain name! Setting up a report to view this information takes just a few clicks! From your Above.com Dashboard, select “AutoPilot” in the left-hand navigation bar. Next, click “Reports.” From the reports page, click “Display Domain Demographics” after filling out the period of time drop-down box. The Demographics Report is just one of many reports available to our clients through their AutoPilot dashboard. Each report offers a different angle from which to view the health and performance of your portfolio.